Last night as the sun shone and the Xue Long gently weaved its way through the ice floes towards Zhongshan Station, what can be described as a motivational, team-building ceremony was held onboard in anticipation of what will be the most important and testing Antarctic campaign ever for the Chinese. This was followed by a banquet to celebrate our approach to Antarctica: A feast of traditional dishes, and a long series of toasts raised to the expedition, to its different teams and members. Early this morning, ten days after leaving Freemantle, the relief and excitement was palpable onboard as we reached 68°22'S 76°20'E, just one degree north of our destination: Zhongshan Station, located on a small ice-free peninsula known as the Larsemann Hills in Pritz Bay, East Antarctica. Because of this year's mission to build Kunlun Station at Dome A, this is the earliest that the Xue Long has ever been this far south during the austral summer (as much as a month earlier than in previous years), and it also explains why parts of the crossing were so rough, including storms and some tricky night-time navigation through ice fields and icebergs, even south of 60°S, where darkness will no longer be falling in just a few weeks' time. It also explains why at around lunch time some 58 kilometres from Zhongshan Station, we struck a band of solid, very thick sea ice skirting the coastline. As a result, the Xue Long was brought to a stop whilst a series of reconnaissance flights were carried out on board one of the vessel's two helicopters (a French designed Chinese-built twin-engine Dauphin). Although the helicopter flew all the way to Zhongshan Station, taking various itineraries to see if any leads or openings in the sea ice could be found (but without actually landing at the station), the results were decidedly negative. This has left the Captain and Expedition Leader with no option but to point the Xue Long due South and attempt to break its way through the ice with all the power it can muster. This is a very time and fuel-consuming procedure, which consists of powering full steam ahead and crashing through as much ice as possible until the vessel loses momentum and comes to halt, before backing it up some five hundred metres and starting again. Each time you can gain between fifty and one hundred metres, depending on momentum and ice thickness. 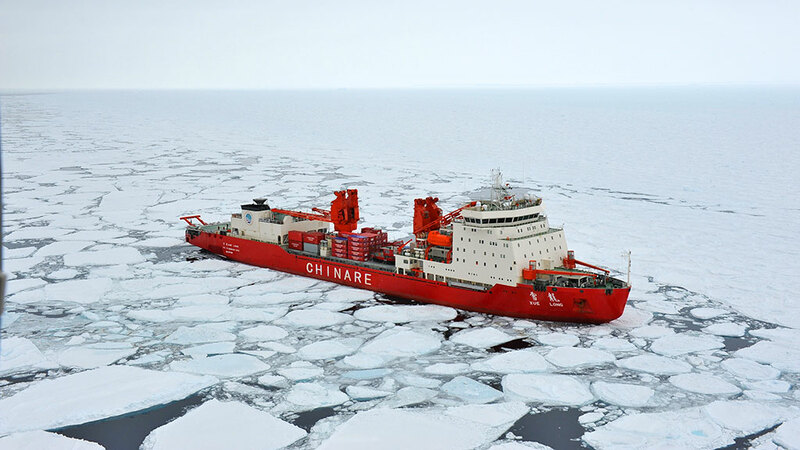 In previous years, arriving at Zhongshan Station in the second half of December, the Xue Long was able to moor in the sea ice some twelve kilometres from the station, from where its cargo was either airlifted to the station by helicopter or dragged over the sea ice by snow tractors, or both. This year, because of the early arrival, the hope is to get the Xue Long to between forty and twenty kilometres of the station, with every kilometre gained greatly simplifying and shortening the unloading procedure.